Available in: 8.5° (RH only), 9.5°, 10.5°, 11.5° (RH only). Briefly: Callaway's best driver in several years? Probably. The OptiFit Hosel adjusts the face angle in Open, Square or Closed positions at address to improve accuracy and trajectory. The OptiFit Weights (12 grams and 2 grams) shift the clubhead’s center of gravity to promote either Draw or Neutral ball flights. The Forged Composite material in the crown is lighter and stronger than titanium. The crown contains over 7 million turbostratic carbon fibers, which allows our engineers to precisely control thickness, resulting in an optimum center of gravity and high MOI. The combination of VFT and Hyperbolic Face Technology creates a large sweet spot and high ball speeds across the titanium face for long, consistent distance. And aerodynamic contours reduce energy loss from drag during the downswing by 14% compared to the RAZR Hawk Driver, creating higher impact speeds for added distance. This is another of those clubs about which I am tempted to write a really short review..."Love it, Love it, Love it! Go and buy one as soon as possible." That would pretty much sum up how I feel about the RAZR Fit. But let me elaborate a little. After 15 years at the top thanks to the hugely successful Big Bertha line, the once mighty Callaway (it still is fairly formidable, of course) has been an increasingly distant second to TaylorMade in the driver market since TaylorMade officially became the best-selling brand of driver in 2005. No one can deny the quality of TaylorMade's clubs - they're superb - but at the same time, one shouldn't forget the brilliance of its marketing campaigns and the fact its roster of players has been hugely successful (partly because of their drivers of course). The introduction of Callaway's Forged Composite material with the launch of the Diablo Octane driver in the fall of 2010 probably didn't produce quite the reaction in the industry the manufacturer was hoping for, and Forged Composite didn't become (at least it hasn't yet) as big a part of the conversation as TaylorMade's White-Out. Who's to say if the reason for that was just bad timing or over-hyped, and largely unfounded, claims about the technology? It was perhaps a bit of both - the launch of Forged Composite more or less coincided with the astonishing success of White-Out, and the eight yards Callaway claimed their new material could produce might well have been viewed with a degree of skepticism, failing to arouse golfers' attention. 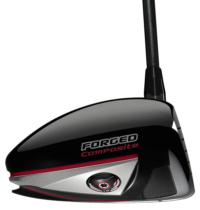 Of course, Forged Composite has not had nearly the same effect on the game that titanium did 20 years ago. But in an age when driver technology has gone as far as the Rules will allow, every genuine distance increase is a considerable achievement. I'm not going to sit here and tell you every one of the drives I hit with the RAZR Fit is eight yards longer than with my previous non-Forged Composite driver. But having read all the science, and knowing that the material was produced in collaboration with Lamborghini which used it to create their concept car 'Sesto Elemento', I do feel I'm hitting a driver with a huge potential for power. You've got to apply the power correctly though, which is where the OptiFit comes in. The RAZR Fit was Callaway's much-anticipated (and overdue?) opening attempt at clubhead adjustibility. The company waited a few years to see if the concept would catch on before deciding it obviously had. The jury is still out on whether or not adjustibility is entirely necessary but, whatever you think, you can't deny how clever the engineers are for coming up with it in the first place, or the marketers for convincing us how beneficial it can be. And regardless of how big or how little an effect it has on their game, consumers want it. The problem for most consumers though, is that their swings are so inconsistent they may get very different results on consecutive days with the same club settings, but similar results with different settings. I'm not the equipment geek I used to be, so no longer spend hours on the range or in the 'backshop' tinkering with the loft and lie of my driver. Over the last seven years, I've tried probably a dozen adjustible models and, to be honest, after taking them out of their boxes, made precious few adjustments. I'm quite tall (6'3") so might have made them a degree or two more upright if possible, but that's it. The Razr Fit comes with the face set to Square (Open or Closed being the other options), a 12g weight in the toe port and a 2g weight in the heel. Other adjustible drivers allow you to alter the club's lie angle and loft, but by changing the face angle you change the club's effective loft anyway. (Click here for a comprehensive and fairly understandable explanation as to why that is). If I wanted to create more drawspin (right to left), I could move the face angle to Closed, or change the position of the weights (more weight in the heel promotes a faster-rotating clubhead making it easier to square up the face before impact). But I draw the ball more often than not, and my bad shot is a quick hook which happens quite often enough without my helping it by adding weight to the heel or closing the face at address. As for looks, with a beautiful, black pear-shaped head, this is Callaway's best looking driver for ages (possibly ever). The back end is nicely-rounded without the elongated, almost triangular, look I really don't like. The black Aldila RIP'd NV shaft and black/red Golf Pride grip compliment the head perfectly. Performance? The sound of impact is fantastic, and I dare say I've picked up a few yards on average with the RAZR Fit. But what impresses me most is its forgiveness and accuracy. In fact I've not felt so confident of hitting the fairway since trying the square-head Nike Machspeed Black nearly two years ago. 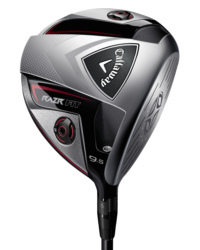 I think the RAZR fit is Callaway's best driver in a long time. It won't help the company regain all the ground it lost to TaylorMade, but it's certainly a step in the right direction. NB Pro Golf Discount on the Guide Meridian has just dropped the price of the RAZR Fit to $299.